Full of vibrant colours, busy streets, bold personalities and an array of smells, Delhi can be confronting but also so beautiful. 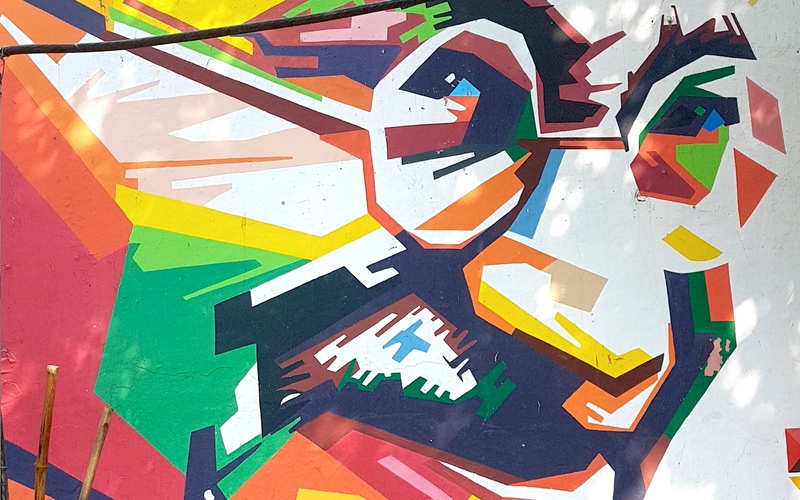 Because it’s best known for historical sites like the Red Fort, India Gate and Agrasen Ki Baoli or the bustling markets like Chandni Chowk and Janpath markets, Delhi street art is a highlight that’s often left off the bucket lists. If you’re into art, you should put these are two areas on your list, especially if you’re looking for a quieter neighbourhood to explore to give yourself a break from the crazier streets of Delhi. This is a neighbourhood full of quiet streets, small markets and huge painted murals that bring the area to life. 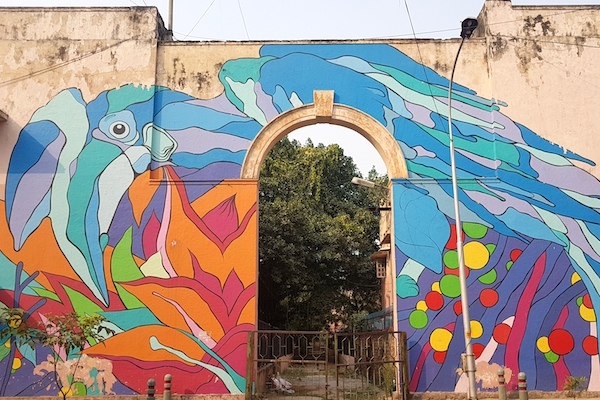 You can spend as long as you want appreciating the street art by 30 renowned artists from across the world as part as India’s first public art district. It’s a fascinating space started by a not for profit organisation called St+Art in an attempt to encourage people to reimagine spaces through art – and it does just that. 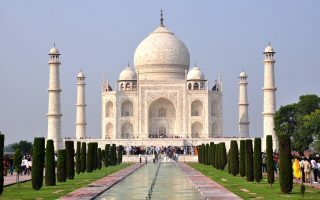 It is a great way to see a new side to Delhi, one which is a little less chaotic than the main tourist attractions. The added bonus – you don’t just get to see the Delhi street art, you get a glimpse into local life. Not feeling the same pressure you do in some of the busier areas, you have a rare opportunity to slow down and take in your surroundings. For example, the street barber shops, with both kids and adults propped up on a chair facing an old mirror hanging on the wall, taking up the whole footpath for their regular haircut. You’ll also see the ins-and-outs of families arriving and leaving from their homes, or mates hanging outside the local appliance store. To make the most of the area head towards Khanna Market via rickshaw or train to Lodhi Station, and weave your way through apartment blocks 1 to 10 until you reach Meharchand Market. If you’ve got no where to be you could easily spend a couple of hours taking in Lodhi Art District and its surroundings. From Meharchand Market jump in a rickshaw and head to Hauz Khas Village, an arty pedestrian neighbourhood with boutique shopping, street art and busy bars. There’s been a lot of noise about this place – first it was known to be one of the most bustling places in Delhi, then people thought it died down completely, and now it’s making a revival. With lots of stores being renovated, this place has the potential to regain its status as the “it” place. In the meantime, there’s still enough for you to explore the streets, grab a bite or relax looking out over the view of the lake in the park next-door over a drink. One of the places with a great vibe is Hauz Khas Social, a café that has delicious food and drinks that doubles up as an alternative workspace. To get into the café you can either walk through a small art exhibition, or a short tunnel with a painted mural and tattoo parlours. It’s just off the main road behind WoW! Momo, a fast-food chain that serves pretty tasty paneer dumplings. Once you’ve taken in the view at Hauz Khas Social, explore all of the small back streets to catch the great examples of Delhi street art. You’ll be pleasantly surprised by some of the random pieces you’ll find along the way. As always in India be cautious, but also be inquisitive about what is around each corner. I found what looked like a small bike parking space that was full of colourful murals which caught me off guard, but was fascinating to take in. For an added bonus, take a stroll through Hauz Khas Fort next door. It is free to enter and walk through the ruins, capture stunning photos of the historical architecture, or to take a break on one of the grassy patches appreciating the view over the lake. 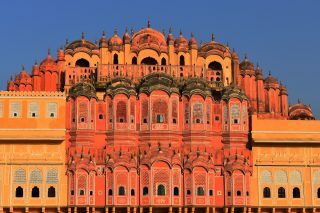 It has a different feel to the other historical forts in both Delhi and other cities of India. What I loved about it was that most of the people there were locals doing their own things – they were enjoying the space in their own way. Despite the serenity, keep your wits about you. Oh, and if the security guard offers to show you around, he will likely ask for a tip at the end. 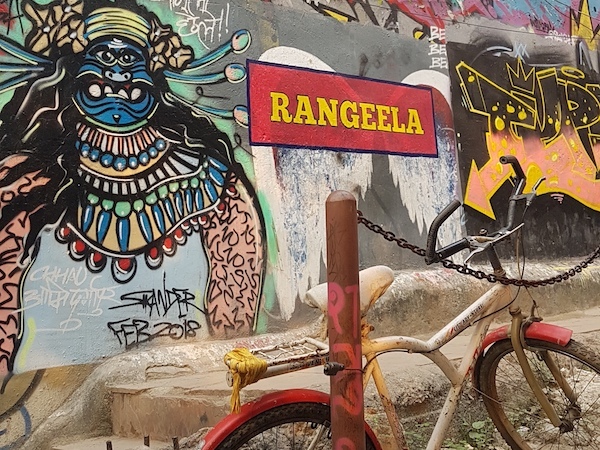 If you want to head straight to Hauz Khas Village to take in the Delhi street art, you can take the yellow subway line to Green Park station and grab a rickshaw. Just remember to negotiate the price. 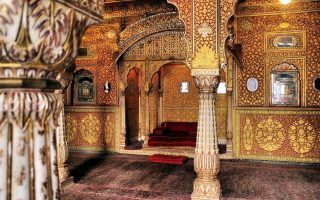 Check out Qantas flights to begin your adventure in Delhi.